It’s safe to admit that when it comes to men’s fashion, no two people have the same preferences; not even twins. From choosing our preferred type of food to having a preference for coffee or tea, or even the types of shoes, every man has his own personal style unique to his preferred taste. A typical example is with watches. Whereas some men may prefer leather made watches, others love those made with chains. This is why many manufacturers all around the world are continually developing new products and services. Simple, classic, contemporary, rugged, no matter your watch preference, watch brands like Bulova has made it a point to provide the right watch to suit your style and needs. Below, we look at twenty of their most exceptional and best Bulova watches for men; the perfect timepieces that highlight everything that makes this brand spectacular. 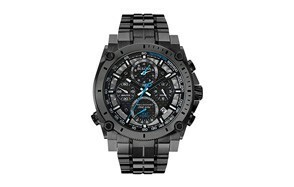 The first Bulova chronograph watch on our list is the Bulova Men’s Precisionist Gunmetal Chronograph Watch. Sometimes, we purchase watches that turn out to be extremely heavy on our wrist, making wearing it a pain. They then often end up collecting dust on our dresser tops or find themselves being sold at a garage sale for a price much less than the original. The Bulova Gunmetal is a stainless steel made watch that redefines beauty by combining ruggedness with refinement; think Bear Grylls and James Bond in one body. This watch features a textured black dial and chronograph functional movement. Also, the Gunmetal watch comes with a mineral dial window and an analogue display for those who still love classically telling the time. Lastly, the Gunmetal watch from Bulova features illumination of the dials, that makes it easy to read in dark areas. It is comfortable to wear and looks terrific on one’s wrist. Bulova is a brand that has survived the test of time since its commencement in 1875. This American brand is known all around the world for their constant craftsmanship quality, innovation and use of advanced technology. Each piece they create is distinct yet feels similar to the next, maintaining the Bulova charm and trademark. With Bulova, you’re assured of receiving a glimpse of the future even with the classic art of timekeeping we all know and love. The Bulova Men’s Marine Star Chronograph Watch was designed and developed by professionals for people who deal with water for more extended periods of time, especially those in the marines. It is a waterproof watch up to 330 feet and features a stainless steel band, quartz movement, analogue display, and a silver-tone finish, all in this single member of the Marine Star Collection. Bulova men’s watches are not regarded as mere timepieces, but rather, pieces of history. The Bulova Men’s Lunar Pilot Chronograph Watch has a history of its own. It is a fascinating story. The Lunar Pilot is a remake of a Bulova brand chronograph worn by NASA astronaut Colonel Dave Scott, when his NASA issued watch, the Omega Speedmaster, popularly referred to as the ‘Moonwatch’ broke down before their trip to the moon. The Bulova chronograph thus, replaced a broken Speedmaster, the holy grail of wristwatches and also made its way to the moon. This pilot watch features a six-hand chronograph, sapphire glass and a stainless steel screw back case that has a silver-tone finish and black dial. In water up to a hundred feet, this watch works perfectly at its standard frequency of 262 kHz to offer you precise timing for every event or occasion. From the moon, we come back to earth to the Bulova Men’s Modern Bracelet Watch. This watch is a member of Bulova’s Classic Collection, a timepiece collection recognized all over the world for its stylish and technological features. Take a bold step through the doors and into that banquet hall with your Modern bracelet watch around your wrist. This watch has been handsomely designed to exude style. Its black and gold theme is an excellent touch making it a versatile watch that fit into any atmosphere you find yourself in. The Bulova Modern watch features an analog-quartz movement, domed mineral glass, a stainless steel case. Metalized edge-to-edge crystal, among others. Its bracelet comes with a deployant closure to ensure a snug fit and this watch can resist water that is up to a hundred feet. Go out in confidence with one of the best Bulova watches for men. 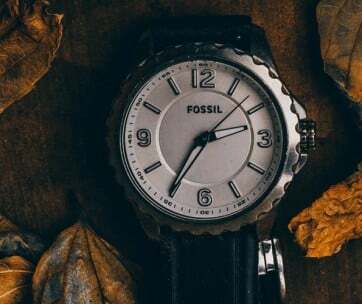 For more great items like this, check out our guide to the best Fossil watches. The Bulova BVA Series Dial Watch is an imported unit and a member of their Automatic Collection. This watch is a beautiful little time all watch lovers and collectors would love to own. It is designed for men who the classic timekeeping features being combined with a bit of futuristic element to maintain their contemporary look. The Dual Aperture Dial watch is a mechanical, self-winding machine that has a 21-jewel movement, visible through its exhibition case back and doubles on-dial aperture. No batteries are required, as the watch is powered 100% by the wearers’ movement. Other features of this Bulova watch include a genuine leather strap, patterned brown dial with luminous hands, scratch resistant material and a water-resistant case, polished stainless steel case that can withstand splashes of water and rain. Create a history that is unique to you with the Bulova Japanese Quartz Watch, another member of the Precisionist Collection that revolves around accuracy. It includes some of Bulova’s most excellent timekeeping pieces that were created using their custom-engineered torsional resonator movement. This all-black watch uses a three-prong quartz crystal to provide accuracy from seconds to a year, by the creation of a vibration frequency of 262.144 kHz. This is undoubtedly the highest frequency possessed by any watch in the entire world. The Japanese Quartz Black Watch features elements such as curved crystal, a grey and silver dial, multi-layered black carbon fiber, luminous hands, and markers. Made in Japan, this Bulova automatic sports watch comes with a round case, stainless steel bracelet with deployment clasp closure and three subdials. It is stylish beyond possibility. It’s almost time for the Christmas dinner party, and you’re wondering what kind of timepiece to put on. You don’t want to look extra and yet; you don’t want to blend in. 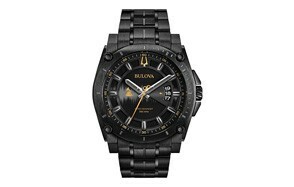 For a distinguished and classic look, the Bulova Men’s Black Watch is one to the eye. This watch is a step above many when it comes to class, with its stainless steel bracelet that comes with a deployment clasp closure. It is a multifunction timepiece that features Japanese quartz movement, analog display, a round case with a black dial and a slightly domed mineral dial window. With s4 hour functionality and water resistance of up to thirty meters, this watch makes a perfect stylish gift and can act as a great wingman for you and your friends, making sure you get back from that party on time, right after running in the rain to the train station. All around the world, women are known to be ardent lovers of all things that glitter. Women love to wear pearls and crystals whenever they get the chance. Believe it or not, men love gems too. They get dazed by their beauty just as women do, and they would love to own their very own also, just like their female counterparts. The Bulova Swarovski casual watch is a beautiful sight to behold. Sitting atop its bezel, blue dial and bracelet are 318 Swarovski crystals. 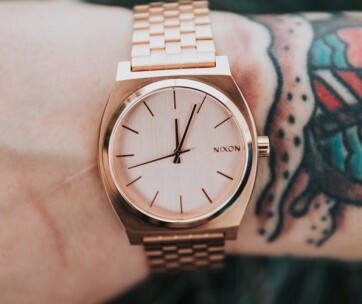 This watch is available in gold-tone stainless steel and features luminous hands and markers, a six-hand multi-feature movement, mineral glass, and a thirty-meter water resistance level. The Bulova Swarovski partnership has created an incredibly unique timepiece that boldly encompasses all the elements of beauty into a single entity. This gold watch is an excellent find and a terrific collector’s item. If you are a timepiece enthusiast who leans towards leather watches, you will love the Bulova Dress Watch with Croco Leather Band. Every watch created by Bulova is distinct, and exhibits its uniqueness in many ways, be it via the type of casing, dials, movement, or finish. Though different, they all carry the same Bulova spirit, with some similar features running through each of them. 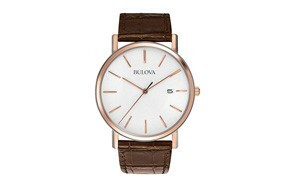 The Bulova Leather watch is a round minimalist watch with a rose gold-tone polish, a white textured dial, and slim indices. The buckle for this timepiece is made from Croc-embossed leather and has a brown strap with buckle closure. Other features include its water resistance, rose gold accents, a mineral dial window, and around watch case. This dress watch can be worn for any occasion that requires you to make a statement with your apparel. Bulova has grown over the years, from a single New York shop in 1875 to an entire franchise with outlets all around the globe. They are a brand that is committed to maintaining the legacy of excellence and creativity established by Joseph Bulova, its founder. They stand proudly in the vanguard of timekeeping technology and have developed the Bulova Automatic Stainless Steel Casual Watch for that reason. This is an all-black Bulova automatic watch, and its adored by the contemporary man who still loves simplicity. With its black outer dial and black plating all over, this watch is a member of Bulova’s Automatic Collection and as such has similar features with other collection members. 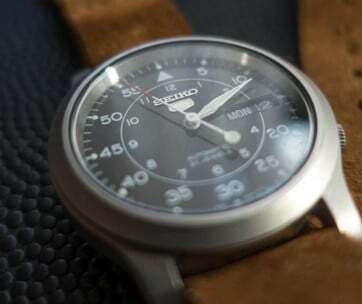 Some of these features include a stainless steel bracelet, a three-hand analog display that comes with an exhibition case back, automatic movement, and a see-through dial that makes the watch feel unique. Our guide to the best titanium watches features more similar items, so check it out! The Bulova Precisionist Stainless Steel Chronograph Watch is a professional dive watch made for advanced timekeeping. Developed and designed to be infinitely accurate, this intricately styled Bulova piece comes with the Precisionist trademark; the three-prong crystal Precisionist movement, together with a second hand that has a continuous sweep. Aside from its high level of accuracy, this timepiece is one that exudes confidence and style and can be paired with any attire, be it a three-piece suit or jeans and a shirt. The Bulova Precisionist watch is also resistant to water up to a depth of 300 meters and as such, is safe for use while you learn how to dive. The future of timekeeping is here, in this little yet powerful piece, and you should get yourself in on all the action. The Bulova Special Grammy edition watch is a casual timepiece made as a part of the Precisionist collection. This watch features an anti-reflective curved sapphire glass, a matte black dial with gold-tone accents and IP stainless steel casing, a calendar feature and a screw-back case that has the Grammy logo stamped on the back. The Grammy edition watch comes with a stainless steel bracelet that has a double-press fold-over closure. It also features the Precisionist trademark, the unique quartz movement with a vibrational frequency of 262 kHz, which is eight times above the rate of standard watches. The Bulova brand has many collections to its name, some of which are the famous Precisionist collection which is made of timepieces that have the highest frequencies in the world, the Automatic collection and the Marine Star collection, a compilation featuring clocks that are suitable for use both on land and underwater. The Bulova Marine Star Two-Tone Chronograph watch is a timepiece designed to have a high performance. This stainless steel piece comes with a two-tone ion-plated finish, featuring gold and silver colors. It also features a blue anodised aluminium bezel insert, a rotating ratchet bezel, luminous hands and markers, a sunray dial, screw-back case, small sweep, and a fold-over clasp that has an extender. The Bulova Marine Star Chronograph has a water resistance level up to a depth of 100 meters. This may be less than the Grammy edition watch, but it enables the wearer to enjoy a little moisture during a hot summer day. Be sure to also check out our reviews of the best Daniel Wellington watches. We all have busy days and days where the hours seem to drag. No matter the tempo of your day, ensure that you look stylish and feel exceptionally confident all day long with this handsome Bulova design. The Bulova Modern Stainless Steel Two-Tone watch is an eye-catching blue and gold-tone timepiece that was created to turn heads and fetch compliments. Featuring a blue dial, silver and gold-tone finish and curved mineral glass, this Bulova gold watch is one that is admired and wanted by many watch enthusiasts and collectors. The Bulova brand prides itself in creating pieces and extensive collections for every occasion you could think of. Their watches are always high quality, crafted from some of the finest materials such as surgical grade stainless steel, carbon fiber, Swarovski crystals and leather among others. Find more amazing products like this by checking out our guide to the best green dial watches. Another Grammy edition watch makes the cut in our selection, the Bulova Grammy Watch Stainless Steel and Silicone Casual Watch. This Grammy Edition watch is a member of Bulova’s Precisionist collection thus it shows signs of perfect accuracy. It features a matte black dial and IP stainless steel case, a calendar feature, screw-back case, anti-reflective curved sapphire glass, and gold-tone accents. The screwback case is designed with the Grammy logo stamp on its back, making it the perfect collector’s item. For unparalleled timekeeping accuracy, this Bulova black watch and other members of the Precisionist collection are powered by a unique three-prong quartz crystal feature that vibrates at 262 kHz. Celebrate the best moments in music with this timepiece. Don’t forget to also check out our guide to the best G-Shock watches. The Bulova BVA Automatic Strap Watch is a member of the Self-winding mechanical collection. This is a collection where the wearers’ movement controls all operations of the watch, and as such, no batteries are required. This Bulova men’s watch features an exhibition case back through which the wearer and his admirers can appreciate the timepieces 21-jewel movement. It is a stainless steel piece made with domed metalized crystal, luminous markers and hands, a small sweep, patterned black and grey dials, a 24-hour subdial, black leather strap, and water resistance to a 30-meter depth or less. No watch lover should miss our guide to the best skeleton watches that features more amazing products like this. Look sharp every day you put on your Bulova Men’s Automatic watch. This timepiece is made of stainless steel and a member of the automatic collection; thus, it derives its strength from the activity of the wearer. This men’s watch has a three-dial analogue display, an open aperture and Bulova detailing, making it a unique clothing element. It carries a distinctively rectangular shape whilst offering an exhibition back and a plastic sapphire dial window. Bulova seeks to bring out the classic man in you, which is why they’ve researched into the designs of their watches. The Bulova Men’s Watch can be worn with almost everything and still look spectacular. Our guide to the best Rado watches features more excellent timepieces, so be sure to check it out. Another exciting, stylish and highly functional collection under the Bulova brand is the Military collection. This collection features chronograph watches that are designed to withstand anything nature throws at them, just like members of the military. It Is highly resistant to water and can be used for snorkelling and swimming. It comes with a double-curved box crystal, black dial, serrated bezel, calendar, brown leather strap, and a hundred meter water resistance level. This Classic leather watch from Bulova is extremely easy to read with clearly marked indices with retrograde indicators. Be it day or night; your clock will be visible to you for keeping you on time. This military watch will be an ideal gift for any manly man in your life who loves water-related activities and is also a man of style. Bulova as an American brand is known all around the world for their constant innovation, craftsmanship quality, and use of advanced technology. Each piece they create is distinct yet feels similar to the next, maintaining the Bulova charm and trademark. All timepieces created by Bulova are not regarded as mere timepieces, but rather, pieces of history that can shape the wearer’s future. The Bulova Silvertone Chronograph watch is a member of the CURV collection and is designed for men who admire the classic timekeeping features being combined with advanced technology elements to maintain their contemporary look. The Silvertone features a five-hand chronograph movement, a black strap, caseback and exhibition dial and blue accents. All these come together to create the world’s first curved chronograph movement watch that has precise accuracy and performs higher than many standard clocks. You will find more great timepieces like this by checking out our guide to the best Diesel watches. You’re welcome to the kingdom beneath the sea; where accuracy reigns supreme, and lateness is not tolerated. The Bulova Analog Display Quartz Watch is a unique watch belonging to the brands Sea King Collection. Within its stainless steel casing, many features and elements make this watch stand out from the rest, such as its quartz movement and the use of ultra-high frequency to ensure precision in the art of timekeeping. This watch is also water resistant with a depth of up to 300 meters. The Bulova Analog Display timepiece really is a sea king which can be worn by those who love to play in the water for short periods. Don’t miss our guide to the best altimeter watches that features more great items like this. The Bulova watches brand was founded by Joseph Bulova in 1875. A 23-year-old immigrant, he started by setting up his very first shop in New York City, creating watches that changed people’s perception of watches, how they were worn and how time, in general, was perceived by many. The company grew steadily and expanded, developing watches strictly for men and women. In time they had patented their first electric clock. Bulova is committed to continually improving their products and keeping them abreast with the fast pacing technologies. This leads to constant innovation by the brand which leads to their acquisition of more patents. Bulova is currently a world known brand with different brands and several outlets. Some of the watch brands include Bulova itself, Bulova Accutron and Accutron II, Bulova Clocks and Caravelle New York. The material used in the creation of Bulova's magnificent timepieces are some of the finest materials existing on the planet, including diamonds, stainless steel, genuine leather, carbon fiber, and mother-of-pearl. Bulova is also known for their many watch collections that feature some of the world's famous watches. Collections such the Precisionist, Sea Kind, Marine Start, and Automatic, comprise clocks that operate at high performing frequencies that surpass conventional timepieces.